We provide complete health care and will look after your family’s wellbeing from birth to old-age. We care for every aspect of your child’s health including all vaccinations. Allied Health and Specialists on-site. We provide a complete team of health experts who work alongside our GPs. We offer a comprehensive, free annual health check for patients aged 75 and over. Book an appointment by calling reception. We provide comprehensive advice and immunisations to protect you on your travels. We are open every day of the year to ensure continuity of care. Our doctors are experienced in finding and removing lumps, bumps and skin cancers. You can now arrange a consultation with your GP on-line at your convenience. 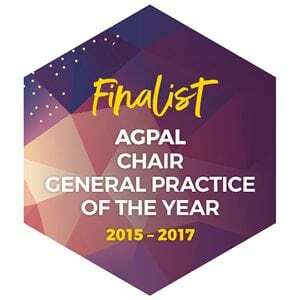 We are proud to be one of five practices in the AGPAL Chair General Practice of the Year 2018 award ranking us as one of the five top practices in the country! 9.00am to 1.00pm public holidays. Our team of highly skilled GPs consist of both male and female Doctors, so you you can select the practitioner of choice at your preferred appointment time. We provide services in all areas of General Practice – preventative health, women’s and children’s health issues, obstetrics and family planning, travel care, sports and work-related medicine and minor surgery – as well as all aspects of general medical care. A wide variety of allied health services are available at Wellness on Wellington. Audiology, Diabetes education, Dietitian, Massage Therapy, Play Therapy, Podiatry and Psychology are all provided from our premises. We have a large number of specialists that provide sessional services at our practice. All our doctors are interested in treating skin lesions, and many have undertaken further training in this area. They are available for skin check consultations at various sessions during the week. Please contact our friendly receptionists to arrange an appointment. Our self-check-in kiosk is available for patients to notify us of their arrival for their GP appointment during peak periods, when our busy, smiling receptionists are unable to provide their usual prompt assistance. Wellness on Wellington which was previously known as Parkridge Medical Centre is the oldest medical clinic in Rowville. We were the first practice in Rowville to be Fully Accredited – a recognition that the facilities and procedures of the practice meet the standards set as the marker of quality care. The founding philosophy – experienced practitioners, dedicated care and quality facilities – sets the tone of the practice to this day. We are committed to providing excellent, friendly care to the individuals, families and community of Rowville, Lysterfield and Ferntree Gully. Our purpose built premises was newly opened in 2010 and has every modern amenity required for a medical facility. All of our permanent doctors hold the FRACGP- the highest qualification attainable in General Practice. Please call early in the day to enable us to schedule a suitable time and be aware that a private fee will always apply.